This Louis Vuitton diamond gold hinged bangle bracelet is an authentic work of art in 18k white gold, set with a single brilliant cut diamond next to the clip at its center. 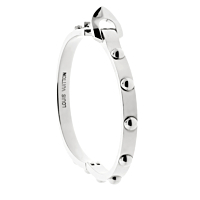 The bracelet is easily opened with pressure on a button in the latch clip. A lovely Louis Vuitton bracelet for every day as well as those special occasions. While the luxury brand was originally founded by a luggage designer in Paris in 1854, Louis Vuitton fine jewelry pieces and other beautiful Louis Vuitton jewelry lines now stand out as some of the most coveted and chic pieces around the world. If you are searching for the perfect Louis Vuitton fine jewelry piece to elevate your style and showcase your sophistication, then why not transport yourself into an aura of elegance and rarefied air by leisurely perusing our stunning Louis Vuitton jewelry collection and all of the amazing earrings, necklaces, bracelets, cufflinks, brooches, pins, rings and other diamond and gold pieces.